Fit-Ink: Bike Friendly or Frenemy? Between steadily rising gas prices, nicer weather, a need for exercise with little time to spare and the thought of being able to pocket the $20 or more in parking costs, I was doing National Bike Month proud. The car didn't take a trip out of the garage--not even for a late-night grocery run, which I often do to avoid peak store hours and unstocked shelves--and I practiced my pedal power to travel around town from work to play, two places that were walkable although not in a time-crunched day. After attending a conference downtown where I've been learning about the food we eat, our nutrition habits and the importance of physical activity, my husband and I decided to ride our bikes to the Bruce Springsteen concert at the United Center last night. I threw out the idea days before more because I was looking for an eye roll than agreement, but he asked how we were getting there and suggested the ride. And this time I was the skeptical one, not only because I was surprised that he found it a good idea but because after suggesting it I realized we might run into complications with locking our bikes. Chicago's pretty good in terms of bike lanes and promoting cycling safety and awareness but oftentimes I find I can never spot a rack where I need to lock up, or said rack is the only one available and there's not a spot to spare. But the United Center claimed to be a bike-friendly venue--not sure what website my husband found that on but I bought it--so we decided to give it a shot, knowing we'd cut down on the drive home after our last foray where a 20-minutes max ride took closer to an hour and we could save our parking money for a snack or concert tee. However, I'm having a hard time finding the bike friendly nature of the United Center. We pedaled there no problem, managed to avoid a huge line of traffic accumulating from the lots and traffic lights, and even found the traffic controllers helpful in having an idea of where the bike rack could be located instead of receiving an "I don't know." We never did find the rack and opted to lock our bikes to a parking sign adjacent to a peripheral parking lot--the guy waving cars into that lot was awesome and assured us someone would be around the whole night and we may as well lock them together instead of separately and high-fived when we were done. For a brief second we both thought his comment meant the exact opposite, that parts would be missing from our bikes when we returned, but he was so friendly we dismissed the thought. But the security outside the United Center truly gave me the bike-frenemy vibe. I'm fully prepared to allow them to search my backpack--smallest one I could find that held the helmets and a sweatshirt and jacket in case the temps cooled off on the ride home and about the size of a larger handbag--but they start looking at me like I have horns coming out of my head. "What's in there? You can't bring that in. You can't bring that in." I don't even remember the exact words but the gist was that the backpack was an absolute no-no and couldn't even pass as a purse. For a bike-friendly locale, I was having difficulties finding the friendly aspects since my pack only held a sweatshirt and windbreaker for the ride home, my wallet so it didn't bulge from my pocket and space for my helmet with my husband's clipped to an outer strap. And I wasn't about to leave my helmet with my bike, since I have enough trouble getting the lock to wrap around the front wheel and thick frame. Plus the pack has passed the bag check at U.S. Cellular Field before when I've gone to a baseball game. 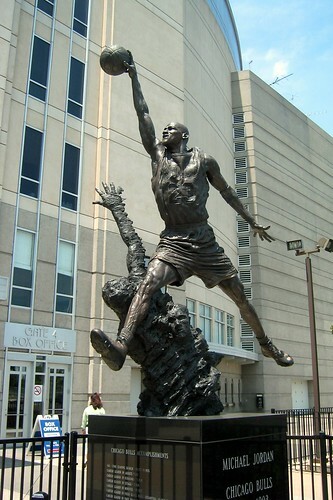 But apparently it's a no-go at the United Center. At least amidst all the to-do to enter the arena--I was seriously thinking they were going to make me ditch the pack somewhere as I've seen contents discarded at other venues--security was nice enough to point me directly to the guest services window just inside the doors to check my bag. And to them it seem all-too-common for someone, me, to be showing up with a too-large item. The woman behind the counter didn't hassle me about checking my bag--made it look like it happens all the time and that it would be safe in this spot--and just went about her routine bag-checking measures. I had a tag stapled to my ticket and strapped to my gear without having to wait in line or fuss before heading to our seats. All I had to remember was exiting from the same entrance and hopefully avoid a line on the way out. No complaints during the concert, once we figured out a way to sit together in our cheap seats (I'm still cursing myself for not waiting to purchase tickets at the last minute through stubhub but that's another story entirely). Being bag-free was a good thing--more room to move around the seats and rock out to Dancing in the Dark, Rosalita, a spur-of-the-moment cover of Mony Mony, The Promised Land and Born to Run, to name a few. I'm the nutty fan who'll stand during the entire show, mouth the words to the songs from my cheap nose-bleed seats and wish I could have scored a floor spot, dance and even lose my voice. Environment friendly bike are the best way to control over different issues that you have with the vehicle. Useful blog sharing. Important blog sharing for informative topics. i read your blog this is truly amazing. Great idea sharing.